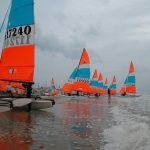 It is a perfect summers day in Noordwijk for the Hobie Wild Cat World Championships, Hobie 16 Open Europeans and Tiger International Cup. The sun is out, blue sky and 8-10 knots. The Gold Fleets sails stand out on the water adding more colour to the day. 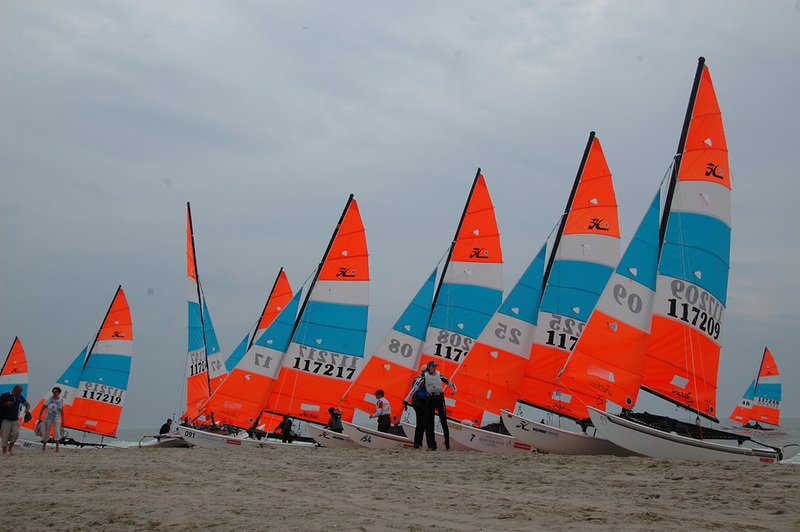 Two courses are used ,Wild Cat, Tiger and Hobie 16 Silver on one course and Hobie 16 Gold Fleet on their own course. 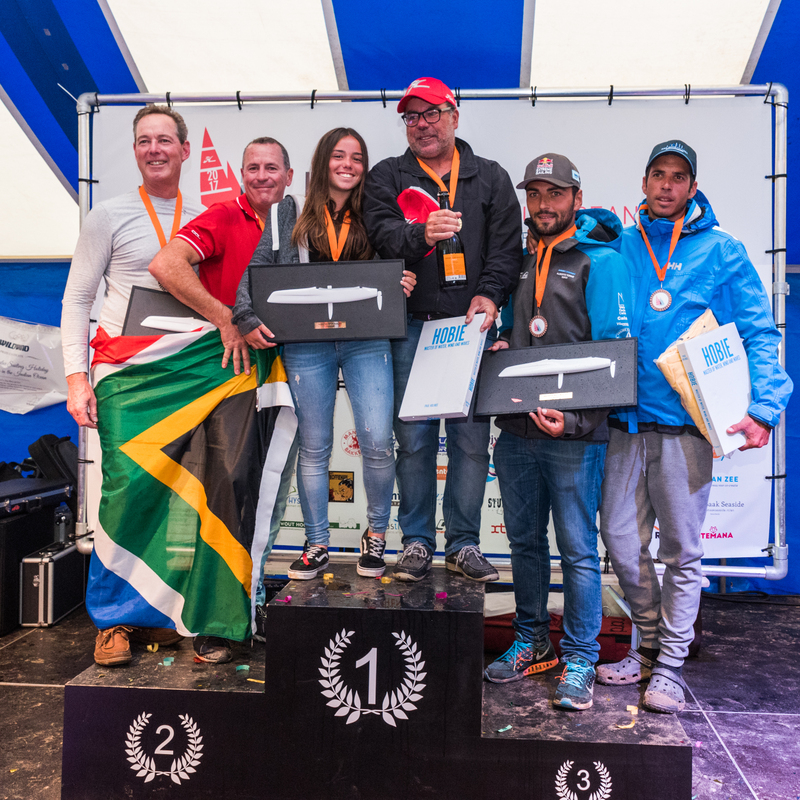 The Hobie Wild Cat World Championships had only two races due to the wind dropping down to conditions that didn’t allow the boats to sail against the strong tide. 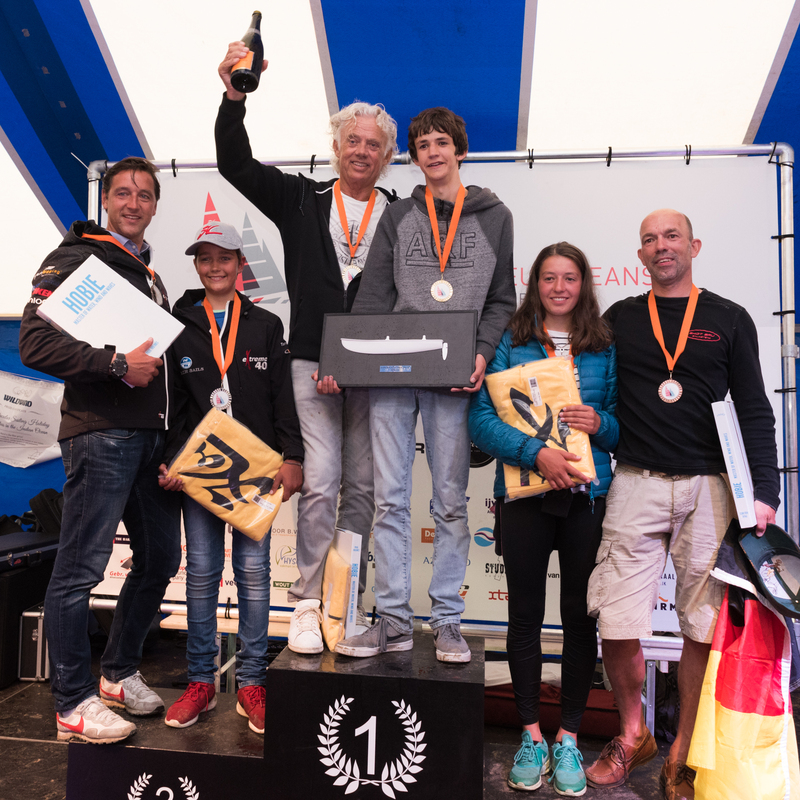 Reigning World Champion Mitch Booth (ESP) sailing with his daughter Rita won both races. Mitch commented after the races ‘it was quite challenging conditions and easy to make a mistake and easy to slip back in the races’. 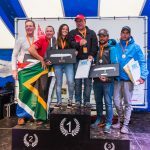 It is not surprising as the top three placegetters are all Hobie World Champions. 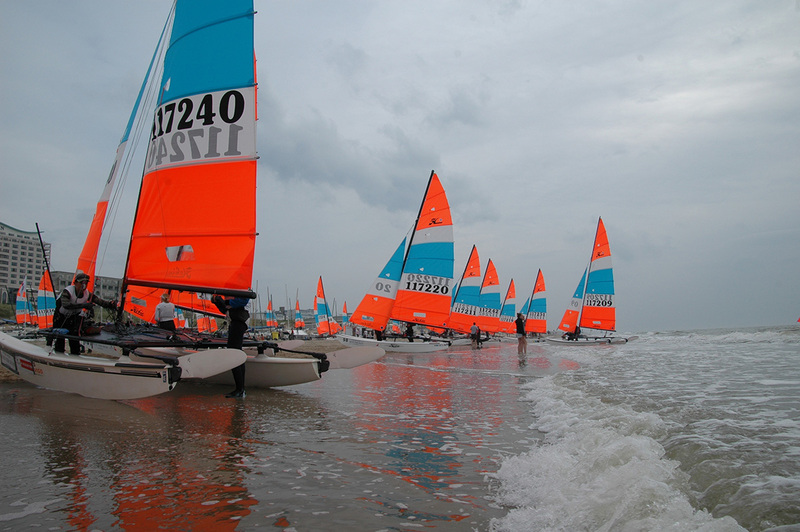 The 104 Hobie 16 teams for the Hobie 16 Open were divided into two fleets. 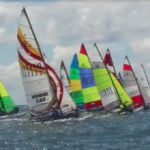 The Gold Fleet of 57 boats was from sailors that had qualified I their own country and those that had made it through the qualifying round sailed over the past two days. 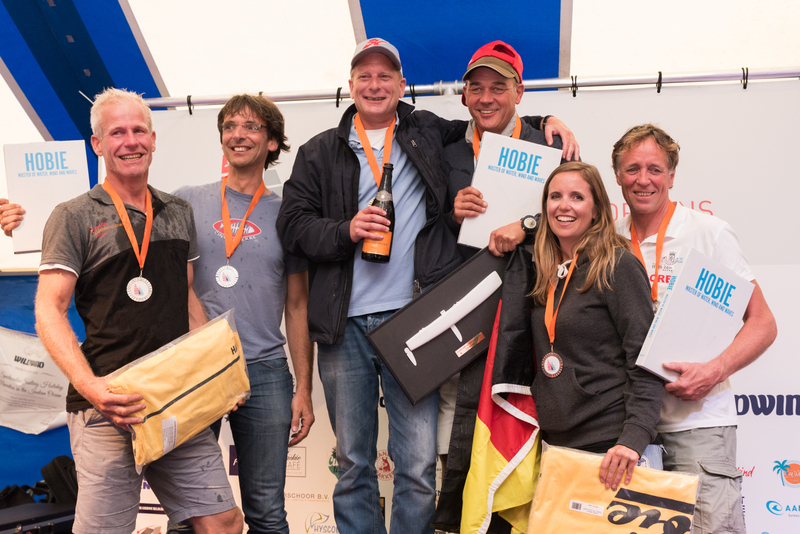 All 57 teams in the Gold Fleet were given sails and battens supplied by Hobie Cat Europe. 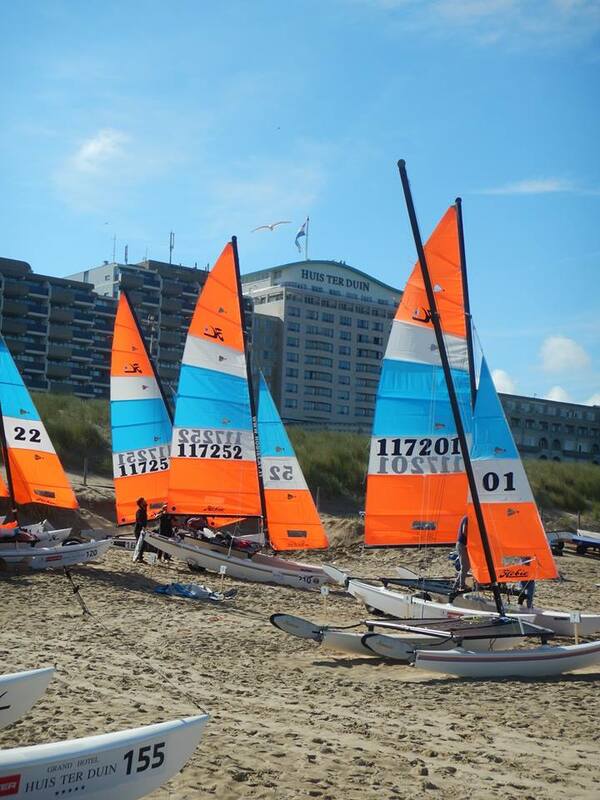 The very colourful sails added to the day and the Noordwijk landscape. 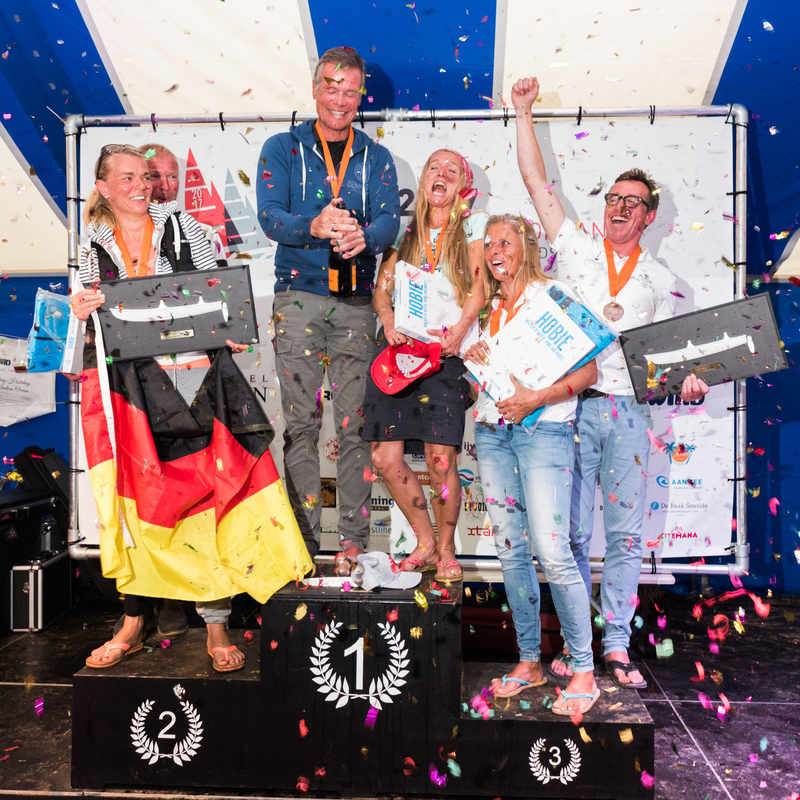 The second day of the Hobie® Wild Cat World Championships , Hobie 16 Open Europeans and Hobie Tiger International Cup sailors were treated to some excellent Hobie sailing conditions. With the last races of the day sailed in an average of 18 knots with a gust of 22 knots. 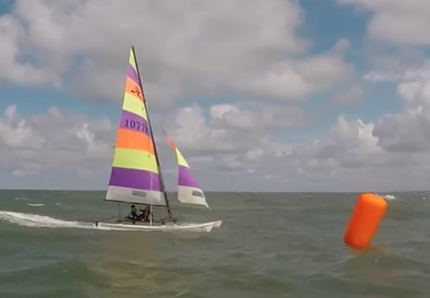 With a small swell running the sailors had some of the best downwind sailing conditions. 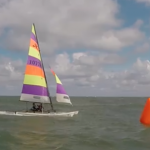 The Hobie Wild Cat World Championships had four races, which tested the limit of the sailors. The leader board has the top three placegetters are all Hobie World Champions. 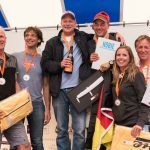 The Hobie 16 Gold Fleet leader board had a shuffle of placers with all the top spots being master sailors. With urrent Hobie 16 World Champion, Daniel Bornholt DEN back in 8th place. 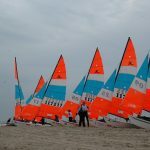 Unfortuntley for Daniel his crew was Georgia Warren_Myers who injured herself in the Hobie 14 World Championships and could not compete. While Daniel found a very experienced crew in Rupert Harvengt, they have never meet until the first race yesterday. Also neither skipper nor crew speak a common language. This makes communication on the boat nearly impossible. Though it didn’t stop Daniel and Rupert from winning the last race of the day. Tomorrow will certainly be a challenge for the sailors with 20-25 knots predicted. Unfortunately no racing was possible on Friday due to the waves/surf on the beach and the strong winds gusting up to 30 knots. But there is the video from yesterday to enjoy. On the last day unfortunately for the sailors, the wind did not abate and the sea state made it dangerous for the competitors to sail. 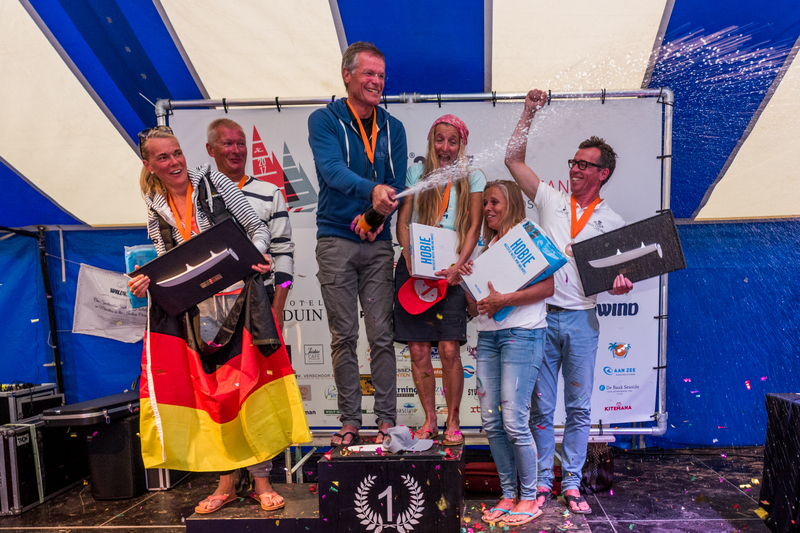 The race Committee called the racing off and the event was drawn to a close. 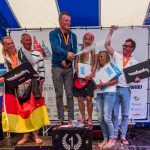 After nearly 2 weeks of racing the 2017 Multiworlds and Europeans was closed. 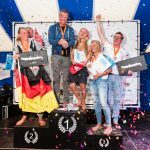 Many thanks to all the competitors and the sponsors for making the 2017 Multiworlds and Europeans in Noordwijk such a success.